Could The F-14 Tomcat Operate From The USS Coral Sea And The USS Midway? People seem to have an infatuation with America’s last non-super carriers, the USS Coral Sea (CV-43) and the USS Midway (CV-41). Both ships soldiered on into the last decade of the 20th century even though they were smaller than their super carrier cousins. 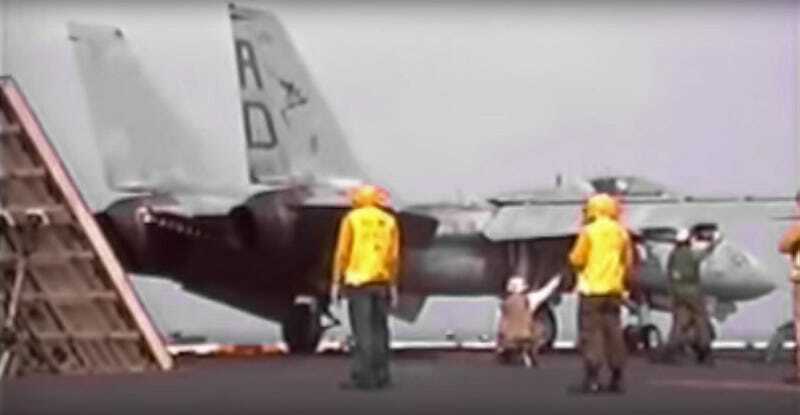 But did the legendary F-14 Tomcat ever fly from their decks? The big swing-wing Tomcats would fly dozens of miles off shore from their land base at NAS Oceana to execute carrier qualification training (catapult launches and arrested recoveries) aboard the USS Coral Sea when super carriers were not available. The F-14s were only flown from these ships for basic training purposes and they would not deploy on cruise as part of the ship’s Air Wing due to a series of fitment issues. During operations from Midway Class carriers, the Tomcats flew out with no stores and operated at lower gross weights, as they could only launch from the ship at full military power - that is, full throttle without the Tomcat’s powerful afterburners engaged. Traditionally, military power departures, used to save fuel, were not common for normal F-14A operations, but became routine when the aircraft’s troublesome TF-30 turbofans were replaced with the much more reliable and powerful F-110-GE-400 engines on the F-14B and F-14D. The F-14 was a big fighter, and the tighter flight decks on these refitted Midway Class ships were a bit of an issue. But they did operate E-2 Hawkeyes regularly and even A-3 Whale derivatives, so size was not the main disqualifier for regular Tomcat operations. The problem seems to stem from the ship’s jet blast deflectors not being able to withstand the high-thrust and extreme heat of the Tomcat at full afterburner. There was a jet blast deflector upgrade made to both ships when the Hornet was introduced in the early 1980s, but still this upgrade appears to have been insufficient to withstand the Tomcat’s full engine output and extremely wide engine placement. Another main issue appears to have been the Tomcat’s height. Its big twin vertical tails weren’t able to fold to fit in these carriers’ relatively tiny hangar bays during key maintenance procedures like testing the jet’s landing gear retraction and extension process. These issues, combined with the fact that air defense capability was available via muti-role fighters with smaller footprints and from the Carrier Battle Group’s guided missile cruisers and destroyers, kept the Tomcat from the Midway and Coral Sea’s decks during operational deployments. Oddly enough, you can see a Tomcat on the USS Midway today. The ship is now a museum and a very popular attraction in San Diego, and one of its most beloved attractions is a Tomcat on display. The USS Coral Sea, on the other hand met her demise via the scrappers torch, with the process being completed in early September, 2000. The Tomcat’s ability to fly off these historic carriers is just one more obscure piece of the beloved aircraft’s increasingly popular lore.